Witness the first appearances of the mysterious Towa Organization - a player in the Boogiepop Phantom anime series - as Boogiepop finds himself hunted by the synthetic human known only as "Spooky E." All the while, the deadly "Imaginator" is out to change the world one mind at a time. Can you escape from the clutches of the Imaginator...? 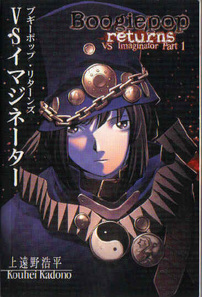 This is the second novel in the Boogiepop series.